Moruya-based jockey Maddy Wright and leading western districts trainer Rodney Robb came, saw and conquered at Mallawa on Saturday – and again proved that they are more often than not an unstoppable force on the NSW picnic racing circuit. Wright and Robb teamed up to win three races at Mallawa, including the 1000m Chesterfield Australia Mallawa Bracelet with proven miler Austin, a horse very close to Wright’s heart. 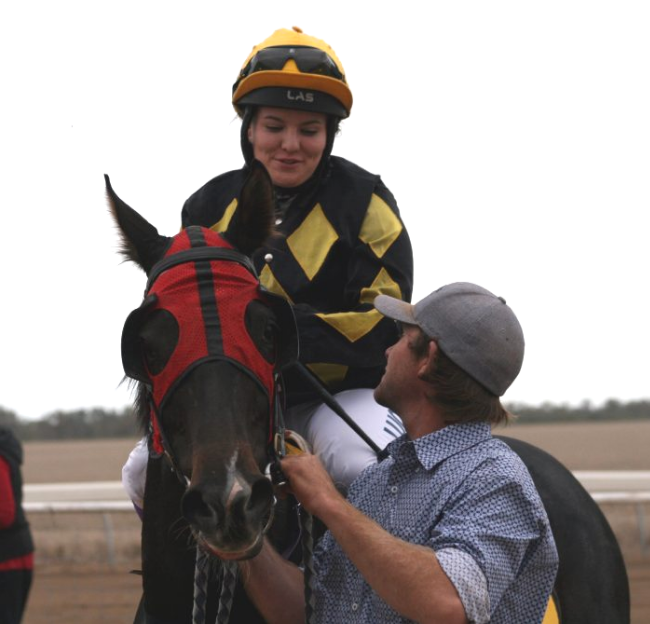 With Wright on board, Austin won the Samara Johnson Memorial Macquarie Picnic Cup at Trangie late last year, a race named in honour of picnic jockey and trackwork rider Samara Johnson who was tragically killed in a car accident near Junee in November. Wright has ridden Austin only twice for two wins, and formed a special bond with the gelding when riding work for Robb at Nyngan last year. “I worked for Rodney for a year out at Nyngan, and I just love the horse,” Wright said. “Nobody else liked him all that much because he can be quite a handful – he bites and stuff like that – but I’ve always gotten along really well with him. “I’ve only had one other race ride on him and we won the Trangie Cup, and that win was in memory of Samara . . . it was very special,” she said. “Austin is very special to me as well and to win over 1000m first-up is exceptional.